Soon to be expanded to include more worlds! Look for announcements for future books and new series here. Or sign up to my newsletter so you won't miss a new release. Those who sign up for the newsletter also receive an exclusive Tiger Shifter short story not currently available anywhere else! Don't miss the most recent book in the Tiger Shifters series. 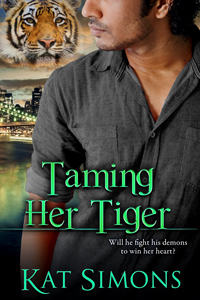 When tiger shifter Ethan Gupta discovers Amy Donovan is being stalked by another tiger shifter, he knows he’ll do whatever it takes to protect her. But learning Amy is more than human turns both their worlds upside down and puts her forever out of Ethan’s reach…unless he faces his inner demons and returns to the tiger world to fight for her. Go HERE for a sneak peek.